INCLUDING ABUNDANCE EXPRESSED AS PERCENTAGE FREQUENCY. Percentage frequency = the percentage of the total number of quadrats sampled over the whole site which contain the species. For example, a percentage frequency of 100%, means that the species was found in all quadrats sampled. A + sign indicates that the species was seen on the site, but was not found in any of the quadrats sampled. Characteristic heath species are in blue print. Brachythecium rutabulum (Hedw.) B.,S.& G.
Bryum microerythrocarpum C. Mull & Kindb. * Campylopus pyriformis (Schultz) Brid. Eurhynchium praelongum (Hedw.) B.& S.
Thuidium tamarascinum (Hedw.) B.,S.& G.
* Blechnum spicant (L.) Roth. * Pteridium aquilinum (L.) Kuhn. * Luzula campestris (L.) DC. * Luzula multiflora (Retz.) Lej. 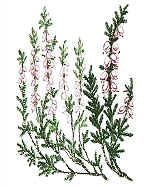 * Calluna vulgaris (L.) Hull.